Santeria.fr offers a consultation online service, for people that are isolated from any religious surround or just need to receive the help from a serious religious familly. The consultations are made ​​with Eleggua’s seashells by a Santera or by a Babalawo with the Ekuele. With this service, we will give you, your predictions and suggestions accompanied by three specific questions that can be answered by yes or no, on different areas of your life. Based around 256 different configuration or letters (called odu) the Diloggun is a sacred conversation with Eleggua the god (Orisha) that open the roads of life, knows all destinies and can intercede on our behalf to change our fates. Each cowrie shell reading will reveal no only the current energetic pattern that surrounds the client, but also explains whether this energy comes with blessings (iré) or misfortunes (osogbo). If the reading comes in misfortunes, it is the nature of the Diloggún oracle to prescribe a solution or ebbó to change those misfortunes into blessings and put you back on track to a balanced and blessed life. Consultations are carried out by the santera Oshun Bomire which was initiated in Matanzas (Cuba) or by el Awo ni Orunmila Ifaladé, Omo Yemaya, initiated in Matanzas (Cuba) in the Ilé of Ricardo Burgois Pintado, Omo Eleggba, Awo siguayu Okana Ka. Santeria.fr ensures the confidentiality of all information that you will receive via email. The amount of a general consultation is € 50 Euros, that you can pay through the PayPal website. As indicated in the sign Oshe Melli (5-5) each visit generates « derechos » rights, money that Santero has the need to collect. If the main sign of the consultation is Iroso Melli (4-4) Iroso tonti Athe (4-8) or a similar sign. In all these cases, the amount of the consultation will be refunded through the Paypal website and therefore, consultation will be free. What is the procedure to request a consultation? What is happening after payment? 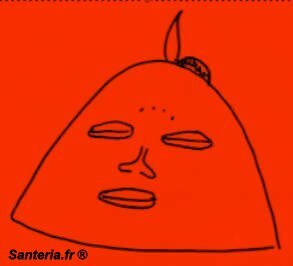 Once payment is verified, you will receive an email from santeria.fr asking you a few personal informations necessary to realize the consultation and the three specific questions you want to ask. The maximum time necessary to receive your consultation after payment is confirmed by PayPal, is between 12 and 24 hours. We will send you at the contact email that you have provided us, all the signs and prophecy with the works (Ebbo) that are recommended.